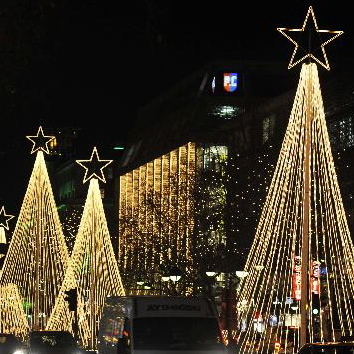 Today Berlin is one of Europe’s trendiest spots, and at Christmas it turns into a giant Christmas Market. KaDeWe (pronounced ka-day-vay) (Wittenbergplatz) is an abbreviated form of ‘Kaufhaus des Westen’; in English this is ‘Department Store of the West’. The ‘West’ of the title is a reference to former Cold War West Berlin. KaDeWe is the largest department store in Europe. Over 80,000 people visit the store each day, shopping for almost anything one could imagine over 8 beautifully styled floors. The food hall on the fifth floor has an impressive selection as well as a popular place to eat. Many people visit KaDeWe just to sightsee. The Europa Center (Tauentzienstraße 9) is an old favourite of many Berliners. With over 100 shops and restaurants, including exclusive luxury shops, as well as a cinema complex, the Europa Centre makes a great one-stop Christmas shopping experience. The newly reconstructed Kranzler-Eck (Kurfürstendamm 16-24) has become another Berliner favourite, partially because of the beautiful architecture. The shops include many well-known retailers and designer shops. The Galleries Lafayette (Friedrichstraße 76) is the beautiful ‘Eastern’ equivalent to the KaDeWe, and a branch of the famous Paris department store. It has become one of Berlin’s most elegant department stores, offering almost exclusively French products. Even though it is much smaller than KaDeWe, it is a popular destination for designer clothes, perfumes, and fresh French produce, as well as a French bookshop in the basement. Exclusive shopping at independent, one-of-a-kind and other luxury brand shops can be found near the Galleries Lafayette at the Q205 and the Q206 (Friedrichstraße 68). This collection of boutiques in the Quartiers has a cosmopolitan feel, making it a concept store of elegant design and living. The Christmas magic market, on the beautiful Gendarmenmarkt is filled with children’s rides, food and candy stalls, and crafts for every taste. This is a great market to visit because of its central location (it’s very close to Unter den Linden) and the relaxed, happy feel in the Market. Before you go, ride the giant Ferris Wheel for the amazing views, but bundle up first! This is the classic German Christmas Market and well-worth going out of your way to visit. With over 150 stands during the weekdays and over 450 at the weekends there must be something for everyone here! Entertainment and music stages are also set up throughout the market, and of course you’ll find all the traditional food and drink, including Glühwein. The Christmas market at Potsdamer Platz is a great stop for families with. The theme is Austria, complete with a toboggan run and traditional Austrian dishes and beer. The market is near the Sony Centre and the good-sized Arcaden shopping mall. If you’re already along the streets of Prenzlauerberg, and you have young children, check out this market. It is a modest market and seems to be aimed at younger children.